I have a thing for pink. I’ve been in a pink mood with v-day right around the corner. Everything I seem to post seems super girly and pink this week. I thought I would share a few of my favorite pink bedrooms, living rooms, and dining rooms to add to all the sweetness. Eventually, a small little nook of a room off our living room is going to become pink. Hopefully, my boyfriend won’t protest too much. My first inspiration shot for the room is above. Let me know if you know any great pink rooms by adding a comment below. Enjoy! A room by Steven Gambrel that I have had on my inspiration board forever via domino. I love this pink dining room accented with gray modeling. A pink wall accents a gallery of paintings. A pink bedroom full of stripes and red accents via domino. 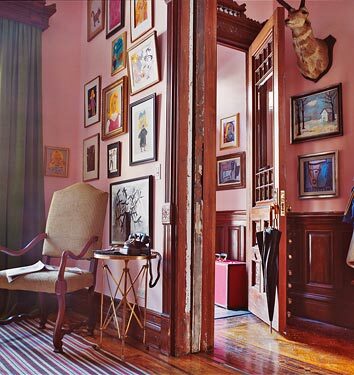 A pink entryway doesn’t feel to feminine accented by masculine dark modeling via domino. 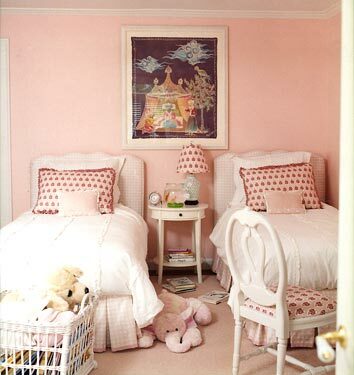 A sweet pink bedroom for little girls via domino. 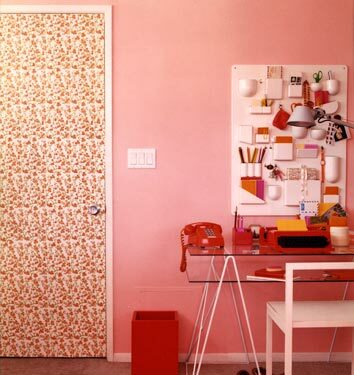 A pink office gets an added layer of femininity with a girly wallpapered door via domino. 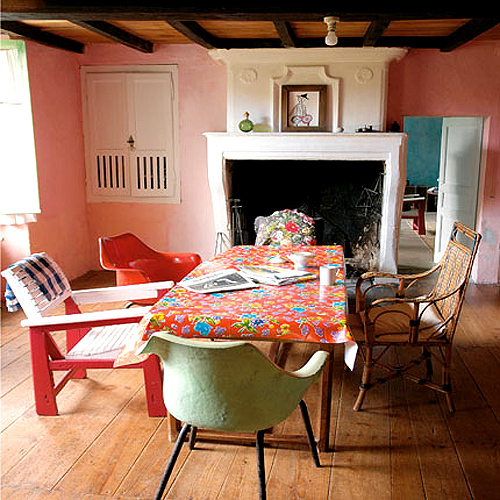 A pink dining room full of colorful and eclectic finds. A pink bathroom every domino reader loves. Gorgeous!!! Funny- I actually have at least two of these in an inspiration notebook. I am late to this post but wanted to tell you -Martha Stewart had a photo spread in one of her magazines (Living, I guess?) in the past year. She has a place in Maine – the name escapes me – and the guest house is decorated in lovely shades of pink. 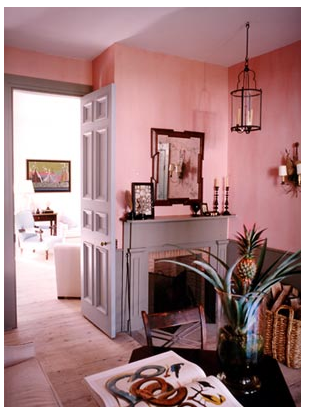 I like pink – and never thought I'd like an entire house done in pink, but it's terrific. You would love it!! Wow, each of these has at least one thing I love in it! Great use of color in most and the textures are wonderful. 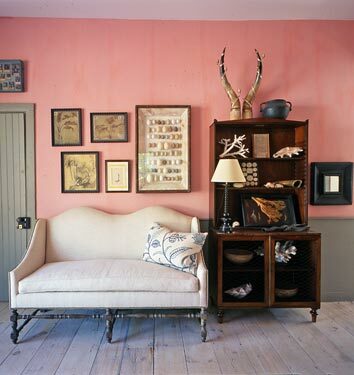 I don't usually "do" pink, but I do love that Steven Gambrel room — a lot! I also love pink but always feel a little scared to use it in my own decorating for fear of it turning out too twee or girly — these all somehow manage [with the exception of the little girl's room] to be classic, quirky, and interesting without being overly-feminine. Love these ideas!! I always loved that one by Gambrel. He's amazing. You chose some wonderful pink rooms! I am loving the one with the gray molding, and the last one with the eclectic style. I love a pink wall when it can be offset by funky decor that tones down the girlyness. 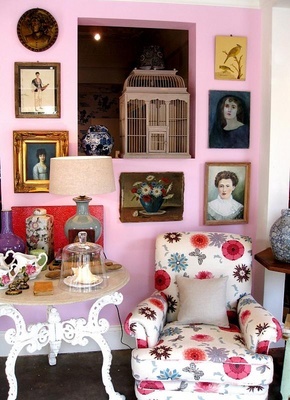 Just came across your blog and I have enjoyed looking around… Love the pink rooms! I'm all about pink, but I have the boyfriend dilemma as well. He would not be so happy to have pink splashed all over our apartment. I'll have to think of clever ways to sneak it in. I am especially smitten with the entryway. I lust after pink, but there is NO WAY my boyfriend will go for it. One of these days, I'm going to dart him and paint to my heart's content! Mmmm…I LOVE these. I have been crazy over pink lately as well! Nice selection of pictures. Love pink, especially for cute little rooms. We have a small powder room off the kitchen and I did it in a coral pink. So glad I did. Definitely do some pink in your house!! I love these pink rooms, katy! especially the first one and i think the last…of the dining room! Hmmm, wondering to self if husband would go for a pink bedroom?? thanks for the inspiration.